Home > Travel > Flight > Budget Airlines > Scoot: Take Off Tuesday Sale with 55 Destinations On Sale from SGD50 All-in! Book by 22 Jan 2019, 2pm Scoot: Take Off Tuesday Sale with 55 Destinations On Sale from SGD50 All-in! Who else plans their holiday around the food they wanna eat? We know we do. When those travel cravings hit, you know it's time for another getaway to satisfy your tastebuds. Drool-worthy destinations coming your way at 7am tomorrow! Book your holiday on Scoot to over 50 destinations with all-in fares from $50! 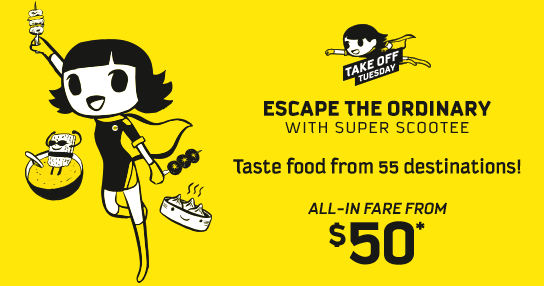 Promotion: Scoot Take Off Tuesday Sale with 55 Destinations On Sale from SGD50 All-in! Previous: [Saks OFF 5th] Your Schutz item is waiting! + Don’t think twice: Up to 85% OFF clearance ENDS soon! Next: [FOREVER 21] Whoa! BOGO FREE just for you!